This is a re-posting of a blog posted back in 2015. I’ve revised it a bit but the heart of it is the same. I share it again, as I believe telling the story is really important. It’s about JOY. And REal Connection. How we connect with each other, telling each other how we feel, is one of the most important gifts we can give. What I loved about the connection between the two children in this post is, they connected with JOY! We all need to learn or relearn how to do just that…it is an Essential Skill. I Listen to the Truth of my Heart. I Act on the Truth of my Heart. What would happen in our World if we did just that? Heard our whispering souls and stopped to listen? What would happen if we allowed Love’s floodgates to open filling our Hearts so Full that Action Steps were clear and impediments in our thinking washed away? What would happen to our Time? What would happen to our Commitments? What would happen in our Relationships? What would happen in our Work? What would happen in our Friendships? What would happen in our Homes? Children open Love’s Floodgates all the time. Their filters not yet muddied, they are in touch with their Golden Buddha. Take for example these “love letters” written by my grandchildren when they were 5 and 9. 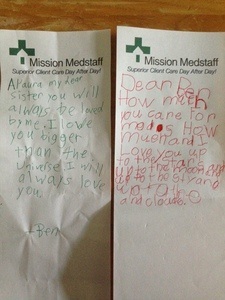 Little Al’aura wanted to write her brother Ben a letter. He responded. He didn’t have to…he wanted to. All on Mission MedStaff scratch paper! They did not let formalities stand in their way. As I have stop to Hear, then Listen, my next appropriate Actions always become clear as a bell. What about you? 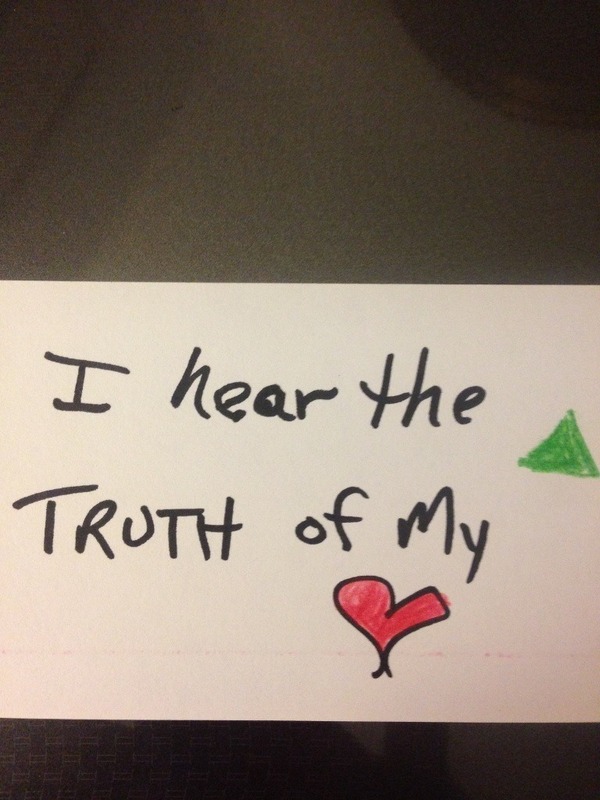 Do you Hear the Truth of your Heart? Are you clear on your reason and purpose? Have you been so busy with the business of living, your Truth has lost priority? Listening to the Truth of your Heart always eventually leads to more inner peace and harmony, more physical and spiritual wellbeing. What is the Truth of your Heart saying to you? Is it telling you to move more, eat “fresh”, leave the office on time instead of working late? Is your Heart telling you to slow down, compliment your partner, pay closer attention? Is the Truth of your Heart saying love yourself more, be kind to yourself, and to those you love and to be kinder to the “not so much” crowd? If you were to stop and listen closely, what would your Heart tell you? Would you recognize what gives you Joy? Hear the Truth of your Heart. Once you are clear, Take Action. Share the Joy!